Balsamic vinegar is made from pressing and aging grape juice, seeds, skins and stems. 3 How Long Does Watermelon Stay Fresh After Cut? The most flavorful desserts combine contrasting, complementary ingredients. Whether salt and caramel, coffee and chocolate or balsamic vinegar and fruit, these pairings enhance a dessert's natural flavor, packing your favorite recipes with extra punch. Balsamic vinegar is a dark, thick vinegar with a sweet and sour taste. Its uses are varied: you can drizzle it over salads, vanilla ice cream, soup broth or roasted vegetables. It has a long shelf life and is generally used in small amounts, so use what you have on hand for baking. You can also use white balsamic as a handy substitute for lemon juice. 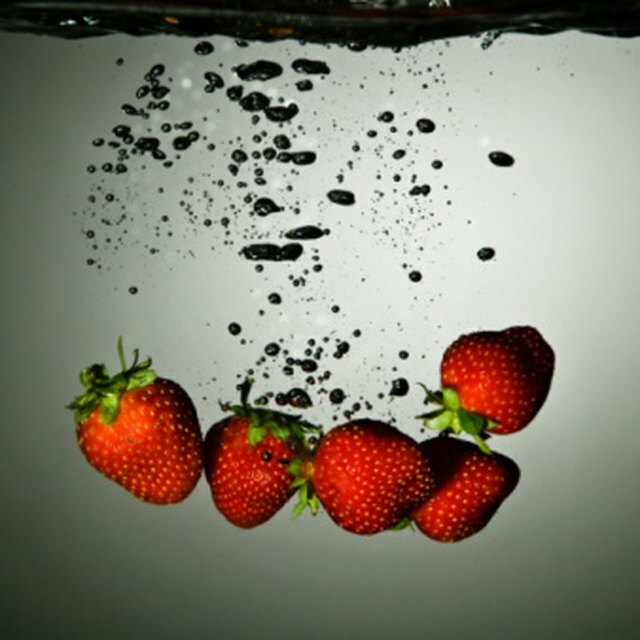 Add equal parts balsamic vinegar and sugar to 8 parts halved strawberries in a bowl. Stir the mixture with a spoon until it is thoroughly combined. Cover the bowl with plastic wrap. Place it in the refrigerator to marinate for 24 hours. Make shortcakes according to your preferred recipe. Most recipes require flour, baking powder, butter, sugar and salt in addition to other ingredients. After mixing the dough, you typically use a cookie cutter to cut out the cakes, then bake them on a sheet pan lined with parchment paper. Slice cooled shortcakes with a knife and place the marinated strawberries between the two halves. Place in a bowl with vanilla ice cream. If desired, top with extra marinated strawberries. Use a wooden spoon to mix equal parts sugar and balsamic vinegar in a small saucepan with half a small sprig of rosemary. A small sprig is one branch with its leaves, about 3 inches. Bring to a boil and simmer until the sugar dissolves, about 5 minutes. Stir occasionally. When the back of the wooden spoon leaves a trail, it has reached the right syrupy consistency. Remove the rosemary sprig and cool. Drizzle over cornbread, shortbread or pancakes. The syrup lasts in an airtight container in the refrigerator for at least a month. Mix balsamic vinegar with 8 parts dried cherries and microwave for 30 seconds. Set aside to cool. Add balsamic cherries to your favorite brownie, fudge or chocolate cookie recipe. For a batch that yields two dozen medium-sized cookies, brownies or pieces of fudge, use about 1/2 cup balsamic cherries. Drizzle extra balsamic into the batter to bring out the chocolate taste. For a batch of cookies, brownies or fudge that yields two dozen individual pieces, incorporate about 2 tablespoons balsamic vinegar. You can marinate the fruit for slightly longer or shorter than 24 hours. Use cubed peaches instead of strawberries or mix fruit with white balsamic vinegar/apple cider vinegar instead of dark balsamic. Use thyme, lavender or another herb to flavor the balsamic syrup. Make sure to remove the rosemary sprig as soon as the balsamic syrup is cooked. You don't want an overpowering rosemary taste. When flavoring chocolate, it's best to use a sweet, syrupy balsamic that tastes good on its own.